In the gorge of Therisso, where in the summer plants and trees are either greyish green (Salvia’s, Olive tree, Jerusalem Sage, to mention some) or dark green (Conifers, Oak) one plant draws the attention: Cionura erecta, with its bright green leaves and large clusters of white flowers. Because it is a poisonous plant, goats and sheep do not approach it and in many gorges and other places it is quite common (I found several plants in the gorge of Messavlia). Much research and comparisons have been done by great taxonomists like Reveal, Cronquist, Thorne, Takhtajan, Stebbins and others; Reveal notes ”The question of concern here is not the number of subfamilies but the number of families” and after much discussion concludes (in PBIO 450) that “the distinctions are still incomplete”. Cionura erecta is obviously in its correct place (in the Asclepiadoideae - Marsdenieae together with the genera Cynanchum and Marsdenia) because it was previously called Cynanchum erectum L and Marsdenia erecta (L.) R.Br. Cionura erecta is a woody-based 50-100cm high and up to 2 m wide perennial with numerous herbaceous sprawling stems, often twining at the tips, with copious poisonous milky juice. At first sight the plant seems glabrous but through a stereo-microscope it turns out that the stems and pedicels are minutely pubescent or ciliate. 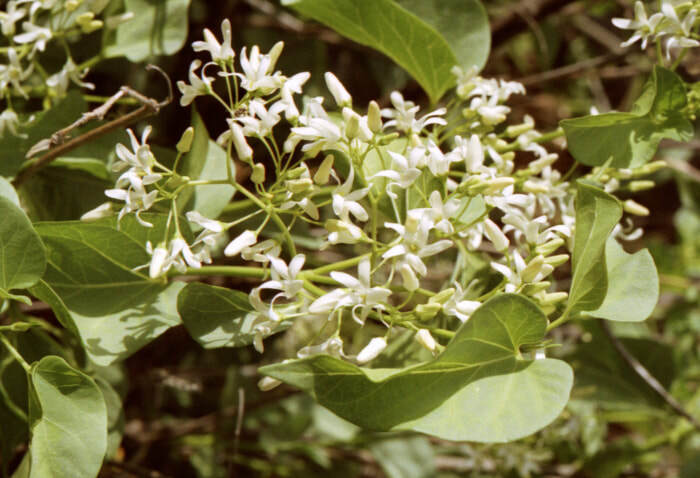 The leaves are long-stalked and the leaf blades are glabrous and herbaceous, 7-12 cm long, 4–8 cm wide, broadly ovate, basally cordate, apically acute to acuminate (heart-shaped) and older leaves are shiny. The (opposite) leaves are described as ‘exstipulate’ but if you take a look at my drawing in detail 3, you’ll see that at the base of the 5 cm long petiole where stipules could be, there are minute structures (round until finger-shaped) and perhaps they could be called ‘stipulate but reduced to colleters; these colleters usually present in the stipular position’. The lax inflorescences are axillary or terminal cymes or rounded umbels of many white flowers, from April until July. 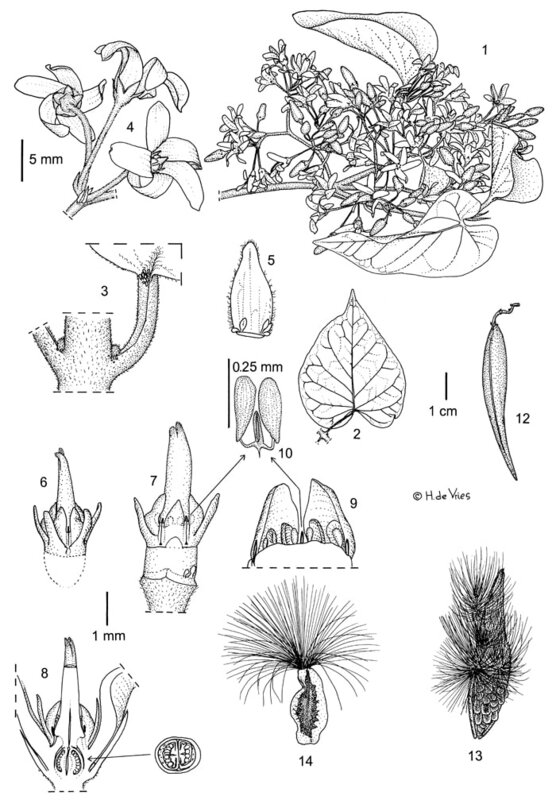 The flowers are radially symmetric, 5-merous, 10-13 mm across with oblong blunt lobes and although the petiole is microscopically minutely pubescent, the calyx is hairless, see details 4 and 8 in my drawing. The calyx consists of 5 connate sepals, they are only basically fused. In the sinuses you’ll find several minute colleters, see detail 5. Colleters on the inside of the base of the calyx are common in Apocynaceae. If you take a look at detail 1, at the bud at the extreme left side, you’ll see that the 5 corolla-lobes in the bud-stage are contorted or slightly twisted, always clockwise. In the open flower these petals are still a little reflexed (detail 4), they are white (rarely pinkish or cream-white), oblong to lanceolate, free and measure about 7 x 2 mm. The size of an open flower is approximately 12 mm. If you take a look at detail 9 (lengthwise section of flower), you’ll see that the ovary is superior and consists of 2 carpels that are free from each other at the level of the ovary and become united somewhere in the middle of the massive stigma. Each single locule has numerous marginal (ventral) ovules. Although there are two loculi, only one develops into a fruit with a thin papery placental flap. The fruits are light brown follicles, smooth, up to 8 cm long and 1-1.5 cm in diameter, narrowly-ovoid and apically acute. The seeds are up to 1 cm long and 5 mm wide, with a half a mm wide marginal wing all around and a terminal tuff of long, white, silky hairs. You can find Cionura in forests, in rocky places, gorges, river sides and even in coastal sands in Crete (many plants in the gorges of Topolia, of Messavlia and of Therisso), in most of the Aegean islands, the South and Eastern parts of the Balkan peninsula and Asia Minor to Afghanistan. Other famous members of the family Asclepiadoideae tribe Marsdenieae include prized cultivated succulents or vines from Asclepias, Hoya (for example Hoya bella), Araujia, Ceropegia, Cynanchum, Stapelia, Caralluma, Decabelone, Marsdenia (now including the well-known Stephanotis floribunda), and Vincetoxicum. The illustrations on this website are copyright protected.